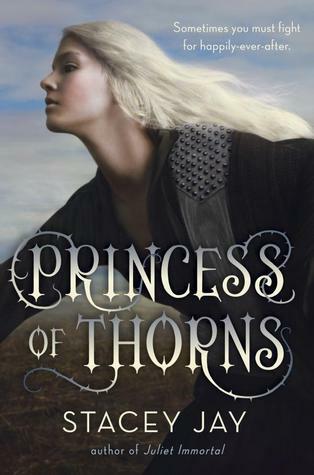 Princess of Thorns wasn't as epic or as awesome as I had been anticipating, and it isn't without its many glaring flaws that made me stop and wonder about it. But in the long run, I found it highly enjoyable and quite an adventure to read. Also, the cross dressing device worked its magic properly. I appreciate that Princess Aurora makes herself out to be convincing enough, pretending to be her little brother--there be no blushing, or giggling, or screaming when a man touches her in friendly gestures or when she and Niklaas have to share a bedroll... at least nothing to really give away her identity. But the knowledge that she must keep her secret without giving away that she has a secret... at least that exciting tension is still there with moments that keep you on your feet as to "is he going to find out?" or "when is he going to find out?" and "how is he going to find out?" The traditional fairy tale of Sleeping Beauty gets a little make over when we are introduced to the fact that the Prince is quite the womanizer and may have several other wives he keeps secret from each other. Sleeping Beauty is then held captive with her two children by an ogre Queen and her ogre priest brother; they have plans to fulfill a prophecy which requires the use of a briar-born child, specifically Princess Aurora who is the one who ends up receiving her mother's fairy gifts upon her mother's death. The adventure starts immediately ten years after Sleeping Beauty dies, having slit her own throat to bestow her daughter with a fairy gift. As children, they were able to escape the ogre Queen with some help from sympathizers. Unfortunately, the younger of the two children, Prince Jor has presently been captured by the ogre Queen, Ekeeta. And thus, Aurora must go on her own journey to save her little brother. With her fairy gift giving her unnaturally increased strength, agility, and the ability to defend herself (as well as some other little tweaks like mercy and the complete devotion of any man who kisses her), Aurora sets out to recruit an army who can either help her reclaim her throne at Mercar from Queen Ekeeta, or who can fight for her to draw away the queen's attention so she can sneak into the castle to rescue Jor. Unfortunately for her, Aurora's first attempted recruiting party captures her instead. But she is rescued by Prince Niklaas, the eleventh son of the Immortal King from Kanvasol who is in search of the briar-born princess with his own reasons, needing to escape his own curse of turning into a swan upon his eighteenth birthday. With secrets kept and deals made, the two set out together to achieve their goals. There's a whole lot of plot that is going on within the scope of this adventure. And while I typically like complex plots and lots of adventure if done correctly, Princess of Thorns felt a bit crammed full of plot. However, the progression of the story itself made it so that you didn't spend too much time dwelling on each plot point and how it's significant as we move on from point A to Point B so very quickly. We just seemed to move from point A to Point B so quickly that it keeps from seeing more about the different types of people and cultures living throughout the kingdom. The story lights upon the raucous city of Goreman for mere moments before our heroes are rushing off to meet with the exiles of the Feeding Hills. No more than a chapter later, we're gliding through mountaintops to escape the exiles. There is so much potential for storytelling at each stop in our heroes' adventure, but we barely get to know the area long enough before the journeying picks up again. It helped that the characters were very likable. Aurora is a kickass heroine who can stand on her own two feet, take care of herself, and stand up against others with the best of them. Often times I've read too many of these heroines created, on paper, to be strong and kickass, but who seem to screw their own kickass-ness by turning into a puddle of "in love with the beautiful man and can't do anything else" type. And their kickass-ness will sometimes take 80% of the story to kick in. But Aurora proves that she's strong and capable from the get go, while at the same time she can be humble and admit her mistakes so that she's also not the type to rush in and cause more trouble than necessary. Creating a strong heroine like this in no way makes Niklaas seem like the weaker partner either. The prince shows that he can manage himself quite well, and although he believes that Aurora is her fourteen year old brother, Jor, he readily whips out the big brother persona to take care of the smaller "boy", while at the same time dishing out the tough, masculine commands like the prince he is. The relationship is set on fairly equal footing, and as noted by another character in the book, the two of them together are stronger this way. Aurora and Niklaas definitely DO make a powerful couple... you know, so long as they can get along with each other in spite of the bickering and the bantering. And the bickering and the bantering is what makes their relationship a fairly sweet one as well. It's more heart-warming than insta-love could ever be--and THANK GOODNESS there is no insta-love. Aurora may find Niklaas to be extremely attractive and "beautiful", as she puts it, but she by no means puts her ideals of falling in love (or the lack thereof) as a top priority. In fact, she doesn't even like the guy at first until he starts to let his good and kind personality traits slip through his arrogance. The world of Princess of Thorns isn't the best built, but it has potential to grow. Even the side characters could have potential stories of their own, but it is really our main couple, Aurora and Niklaas, who carry the story and its progression throughout. It is only unfortunate, in my opinion, that the conclusion felt a little flattened by what seemed like some serious deux de machina twists... however, it seemed to work to tie the entire story together. I would have liked for the conflicts to NOT have been so easily swept aside with one person's decision made. I would have liked to see a more epic fight bring in the climax. I would have liked for Niklaas to NOT be the moody, broody, woe is me, I've been lied to, type after her finds out all of Aurora's secrets... but it worked out in it's own way. I would have also liked for the book to be written in third person rather than the alternating first person POVs, from Aurora to Niklaas to Queen Ekeeta and back. But that's what I would like for many a YA book that really DON'T need to be in first person POV. On a personal level, this was an extremely enjoyable book. And while it didn't live up to all the hype I gave it as I awaited the book's release to the public, I still found that I don't regret making this over-priced Kindle book purchase as an impulse buy to satiate my anticipation. While I didn't love the characters like I'd hoped, I still appreciate the way they were created, written, and presented. As it stands, this is one of few YAs I've thoroughly enjoyed despite all the many quibbles I found throughout. Well, my excitement was over-hyped and I've probably been spewing exclamation points like so (!!!!!!!!!!!!!!!!!!!!!!!!!!!!!) all night knowing that I can now purchase and read this book. Then I finally calmed down. While the beginning was a little confusing, I really am quite enjoying this book so far. Princess Aurora is quite the handful and already wreaking havoc on her journey, disguised as a boy to find an army to reclaim her throne and save her little brother. The fact that she uses a mistaken identity of Prince Niklaas thinking she is her little brother Jor makes hooks the cross-dressing vice right where it needs to be. I am SO looking forward to finishing the rest of this book. Except... I don't know how I like switching first person POVs. I really don't care for them (I barely like single first person POV). We'll see how this turns out though. This update was originally posted at Ani's Book Abyss / BookLikes in December 2014.